How well does HRV reflect overall health? Heart rate variability, or HRV, has long been considered to reflect overall health. Since the 1980s, Professor Steven Porges described HRV as an index not only of stress, but of vulnerability to stress. In other words, the higher someone’s HRV, the more headroom and ability their body has to cope with stress, whether that stress is coming from external (training, mental, emotional) sources or internal sources (chemical, inflammation, disease). An international team of distinguished researchers led by Marc Jarczok at the Mannheim Institute of Public Health decided to analyse comprehensive health check data that included HRV and detailed blood tests as well as the answer to a very simple general health question to see where the strongest relations lay. The researchers used the results of blood tests to determine biomarkers including glucose, lipids and CRP (inflammation), and used questionnaires to determine lifestyle, sleep quality and work stress. 24hr ECG recordings were used to calculate a range of HRV indices including time and frequency domain parameters. 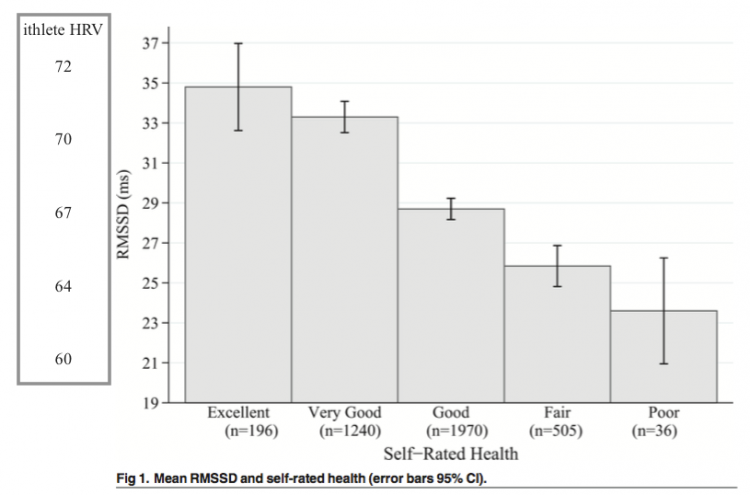 Self-rated health is associated with mean HRV in a linear fashion. The figure shows clearly that the average RMSSD (a measure of HRV) (ithlete equivalent numbers shown on the left) steps up in every category from Poor to Excellent health. Self-rated health was significantly associated with sleep quality, work stress, age and physical activity. Blood pressure measures were all significantly (negatively) related to HRV, and interestingly, more strongly so than heart rate. So knowing this surely measuring your HRV is both more important and predictive of overall health than measuring blood pressure. HRV was significantly negatively associated with LDL (bad cholesterol) and total cholesterol, whereas it was weakly positively associated with HDL (good) cholesterol. HRV was also significantly, negatively associated with fasting blood glucose. HRV was a stronger predictor of overall health than any other biomarker. Being in the lowest 30% of HRV made people three times more likely to report poor overall health. This is the first paper I have studied which paints such a comprehensive picture of the relationship between a simple holistic measure of overall health and many of the most common biomarkers used in health assessments, including blood pressure, cholesterol, fasting glucose and inflammation as well as questionnaires on mood and stress. The fact that HRV (RMSSD, as used by ithlete) was the strongest overall predictor of self-rated health in a sample size of 4,000 working age people lends credibility to the claim for HRV to be a powerful and comprehensive barometer of overall health. An interesting observation related to this is that the range on the ithlete scale from Poor to Excellent is only 12 points. These scores are averages so it’s important to use the (blue) base line for assessments rather than just daily readings. Of course it doesn’t mean that if you get a 60 score on ithlete on one day that your overall health has become poor, but if your baseline is continually declining, there is likely to be an underlying reason that requires attention. Conversely, you can feel rightly proud of upward baseline trends over longer periods of time, which can be brought about by improved sleep patterns, lower stress levels, better diet and higher aerobic fitness. Investigating the associations of self-rated health: heart rate variability is more strongly associated than inflammatory and other frequently used biomarkers in a cross sectional occupational sample. Jarczok et al. Does the Ithlete number reflect the values taken seated, standing or laying down as a reference? My standing score is lower than seated and the spread can vary in terms of response to exercise. Knowing which reference position is an optimal comparison would help to contextualize the Ithlete numbers. We would expect the result to vary between standing, sitting and lying down (with standing being lower, lying down highest). We recommend taking your ithlete reading sitting down because this shows best the correlation with the gold standard ECG measurement, but the most important thing is to be consistent. ithlete uses your personal baseline to determine the colour coded advice so only through consistency will you be measuring like with like. You might also be interested in this Standing vs. Supine ithlete HRV Measurement for a more detailed look at the different positions. I’ve been monitoring my hrv since jan 1st. Every morning when I start my testing I get this feeling of nervous anxiety. Nothing intense. Just the sort of thing where my brain is thinking stuff like “what’s it gonna be today?”, “what’s my HR?”, “is it improving or getting worse?”, etc. I take my test in the lying position and go for 5 minutes while trying to meditate and calm my mind. I have this issue with my BP readings too. You know, that whole white coat syndrome thing. My question is; how much can this affect my readings? The bad news is that it will affect your readings, making them lower than they would be if you were relaxed and not anxious. The good news is that if this happens every morning, all the readings will be equally affected, ie your baseline will be lower, but daily variations due to training, nutrition etc will still show through. I used to get this quite a bit myself, but eventually learned to do my reading almost immediately on waking, so I was deliberately half asleep and had not overthought anything (yet!). If that isn’t possible or doesn’t work for you, ensure the meditation includes slow deep breathing at around 6 breaths per minute. It’s a good point. My immediate thought would be that your HRV would itself be affected more or less by social stressors depending on your degree of introspection. I expect Prof Steven Porges would have a lot to say on this subject – he is a real expert on psychophysiological phenomena. for a single person how well does hrv rpedict overall health day to day? We are going to summarise some research on HRV and illness soon, so that should provide a better answer to your question.